Once you have signed up, you will start to receive your own valuable B Points immediately right at the checkout. These B Points can then be collected and redeemed for fantastic rewards and gift vouchers. 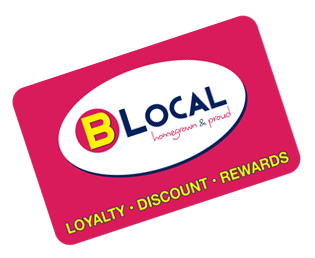 Your B Local card guarantees you an immediate discount and/or valuable B Points at participating outlets. 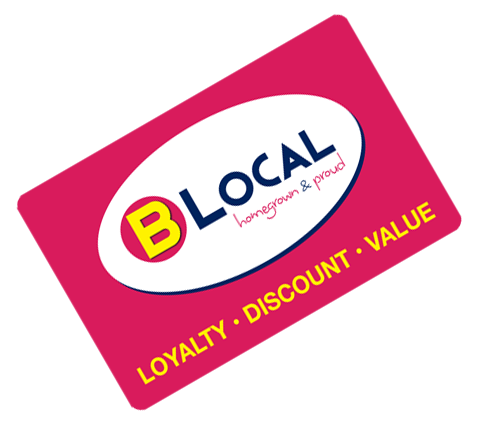 Click here to check out the B Local rewards from all our partner stores. All you need to do is pick up a B Local card from one of the participating stores and sign up there and then, in store. Your card will immediately be active and you are ready to start receiving discounts and B point rewards. Most importantly, it’s 100% free. One card – at all these businesses – a real bonus! I love getting the vouchers in my email every now and then – feels like a treat. It’s really easy to use your vouchers – I like that! No tricks, just good value.